Whitewater rafting is great fun. But it’s even more fun with a group of friends. That’s especially true on the Nantahala where a few short stretches of smooth water provide breaks from the rapids and a chance for friendly banter between rafters. Each year, more than 200,000 paddlers ride the eight mile course that snakes through the scenic Gorge. With its Class II and III rapids, the “Nanty” is a family river, suitable for just about every generation (children must be at least seven years old or at least 60 pounds). Yet it’s challenging enough to have been chosen as the site for the upcoming 2013 World Kayaking Freestyle Championships. National Geographic Adventure and ABC’s Good Morning America’s “Vacationland” series named the Nantahala River the number one place to spend a wet and wild vacation in the US. 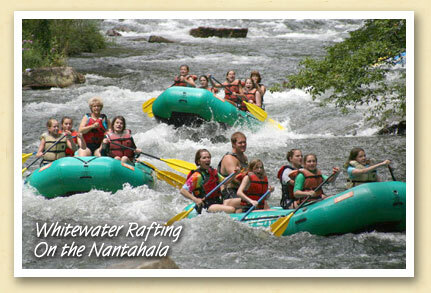 Trips can be scheduled with a number of Nantahala outfitters. A variety of trips are offered and each company seems to add its own personal touch. All outfitters provide approved life jackets and most provide a wet suit and/or paddling jackets during the cooler months.